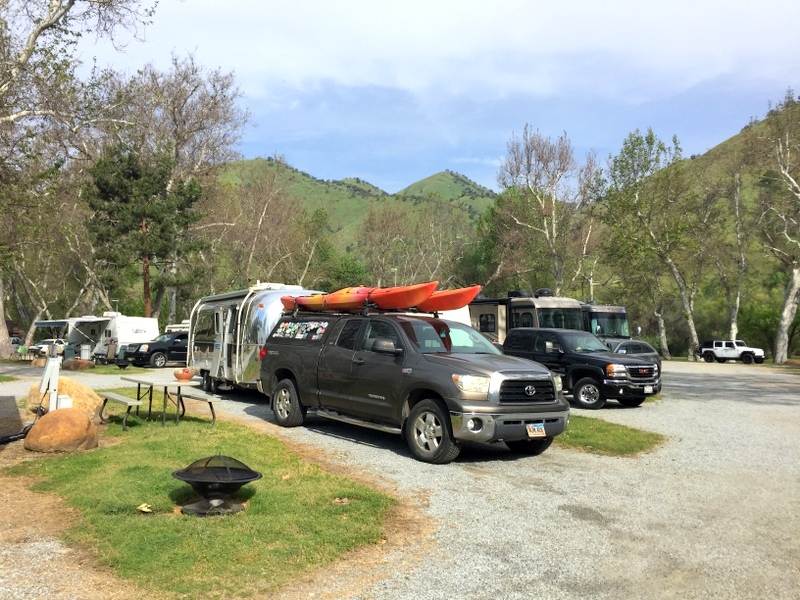 We knew that we couldn’t stay inside Sequoia National Park due to the lack of cell service so we settled on the nice looking COE campground called Horse Creek in the town of Three Rivers. Except we made the mistake of arriving on a Saturday afternoon to find it was full. Woops. That’s exactly why we usually arrive on Sunday. At another time of year we might have been okay, but with the sites rapidly disappearing under the water as the lake level rose with the spring melt there were only so many sites available for our size rig. Not a big deal. We simply drove up the road and pulled into the first private campground we came across. 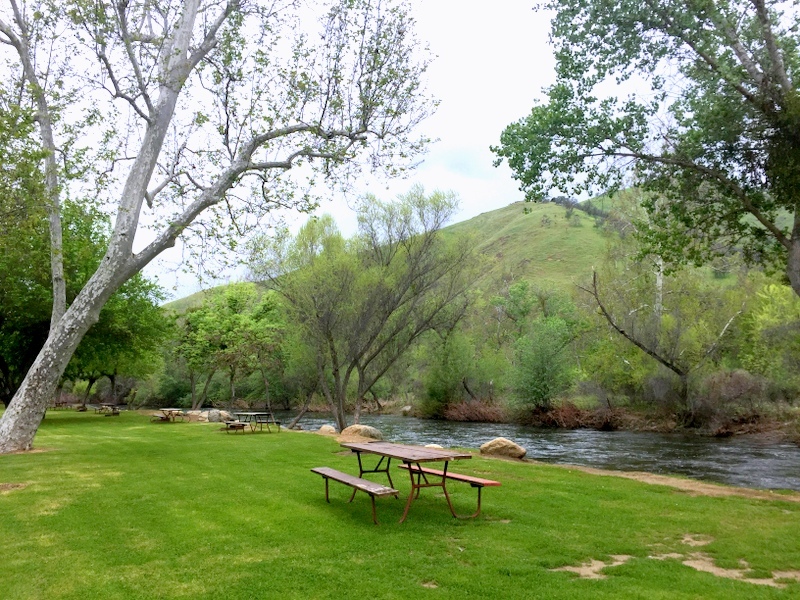 The Sequoia Campground and Lodge is situated next to the Kaweah River among a cluster of trees and green grass. They had a few open sites and soon we were pulling into a site between families celebrating the weekend. 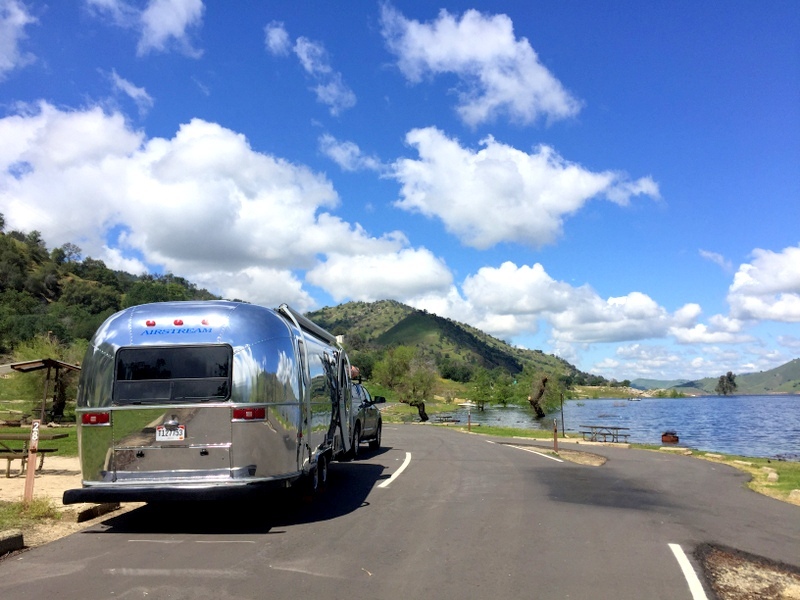 Our one night stay quickly turned into two so we could spend the next day in the park without needing to move the Airstream. 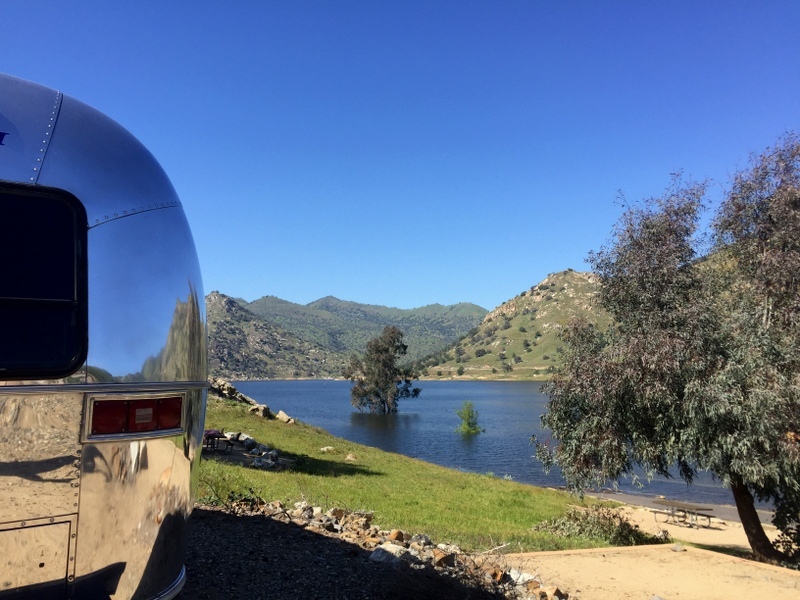 Then we added an additional night because rain was predicted for Monday and we are trying to honor our pact not to drive in the rain if we don’t have to (our polished Airstream is a bit of a diva). Tuesday around noon we drove back to Horse Creek and snagged a waterfront site. The camp host told us we would probably be okay there for a few days before the water chased us to higher ground. She was right. The lake level was rising about a foot a day which equals roughly ten feet of land newly covered by water. It was coming up fast. This site was underwater by the end of the week. By the next morning, the water had already started to cover the pull-thru site across the street. With only a handful of sites on higher ground unoccupied, we decided not to risk missing out on a spot and moved up the hill for the rest of the week. The sites up on the hill remain open even when the water is at its highest, but eventually, the water covers a low spot on the entry road and all campers must hike in. Sometime mid-summer the lake level resides and the campsites re-emerge. So beware if you come here in the spring because most of the campground might be underwater! 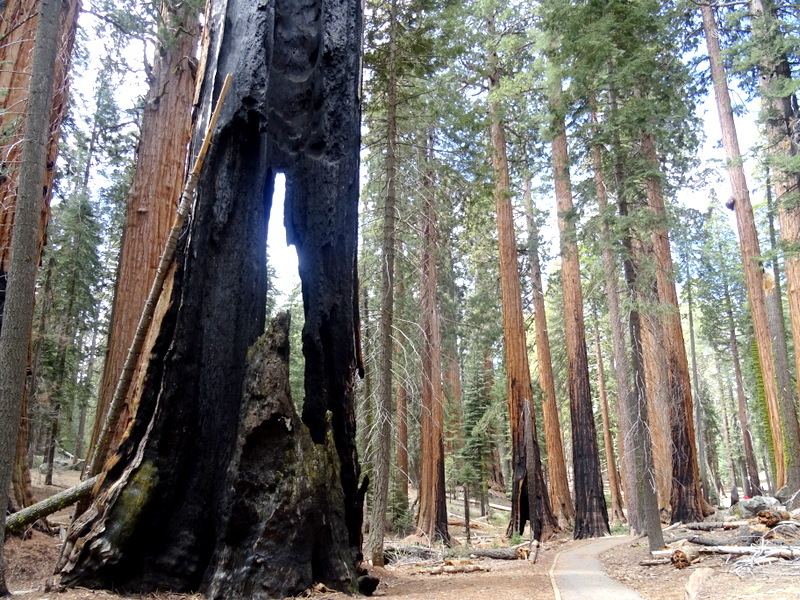 We visited Sequoia National Park twice. 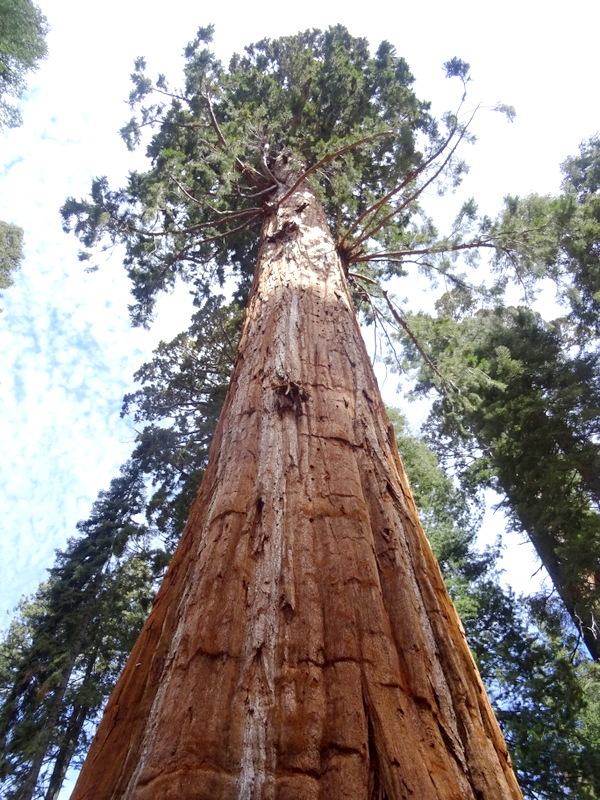 The first time we drove up to the Giant Forest Sequoia Grove where we saw the General Sherman Tree and then continued hiking a 7-mile loop around the forest and up to a mountain viewpoint. There are over 50 miles of trails in the Giant Forest, but after hiking only about 15 minutes past the Sherman Tree, we hardly saw anyone else. This is why I try not to complain about crowded national parks. Usually, all it takes to get away from the crowds is putting the feet in motion. 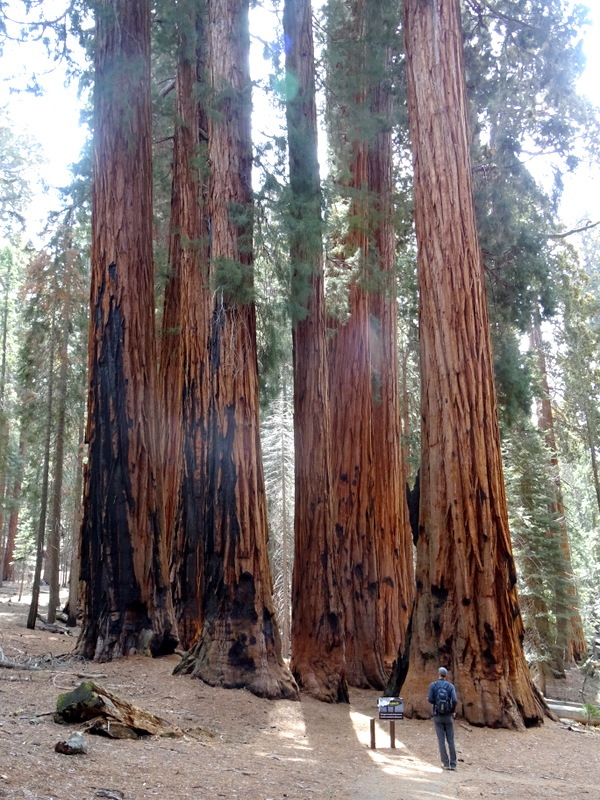 They might be tall trees, but it’s their cousins, the Redwoods, that takes the prize for the tallest. 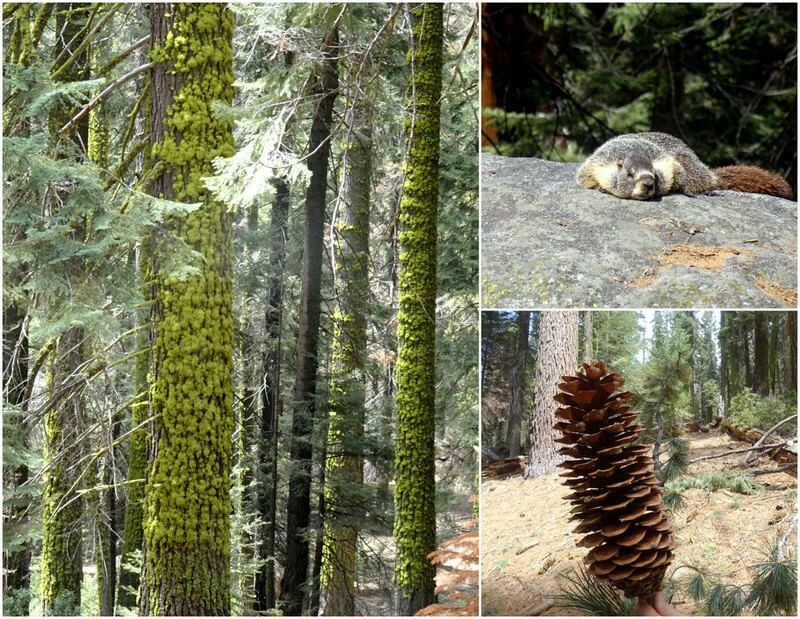 Even without the amazing giant Sequoias, this is a magical forest! The view looking the other way down the valley. Turns out what we thought was fog is actually the ever-present air pollution that forms in the San Joaquin Valley and rises into the mountains. 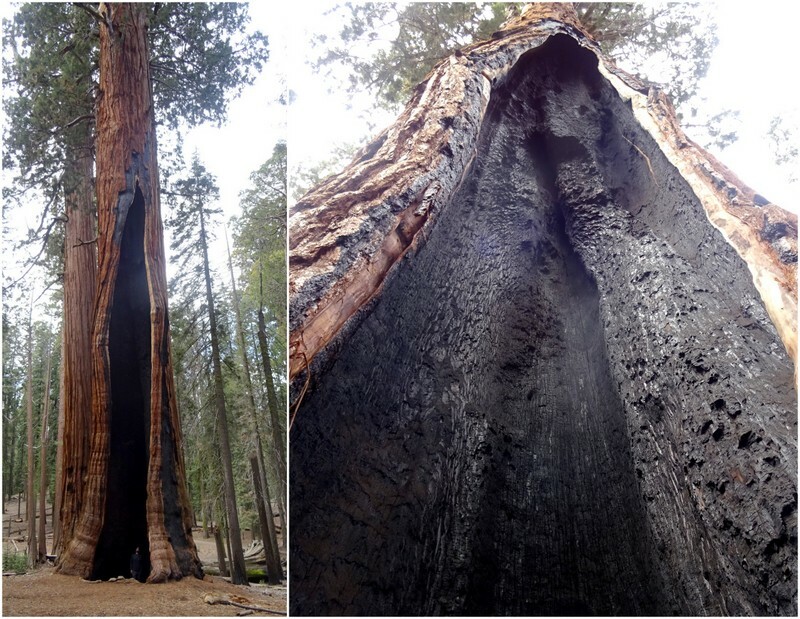 This pollution is currently the greatest threat to the Sequoia trees. On the way home, we stopped at the Giant Forest Museum to learn about the Sequoias. In addition to fun facts about the magnificent trees, we also learned about the conservation efforts the park takes to keep these trees alive and healthy. Things that seem like common sense to us now, like not cutting them down and employing prescribed burns to keep the forest healthy, are only recent practices. When you spend a lot of time on public lands it’s easy to get discouraged by how terrible people treat the land (so much trash!). But sometimes when you step back and take in the long view it’s encouraging to learn how far we’ve come in the way we treat and protect natural wonders such as these groves of giant trees. Our second visit to the park coincided with a free national park entrance day. 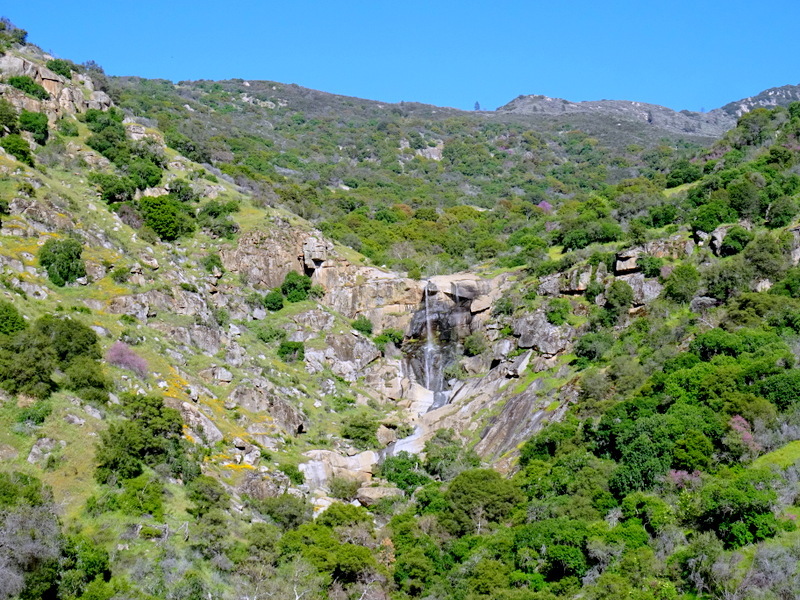 Instead of joining the long line of cars up to the main area of the park, we picked out a hiking trail in the foothills section to avoid the crowds. 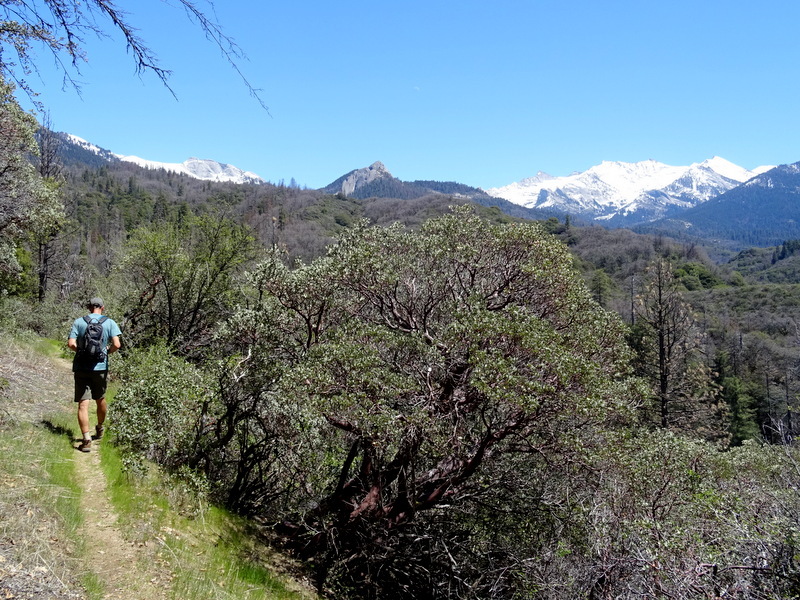 The Middle Fork Kaweah River Trail is used mostly by backpackers on overnight trips. 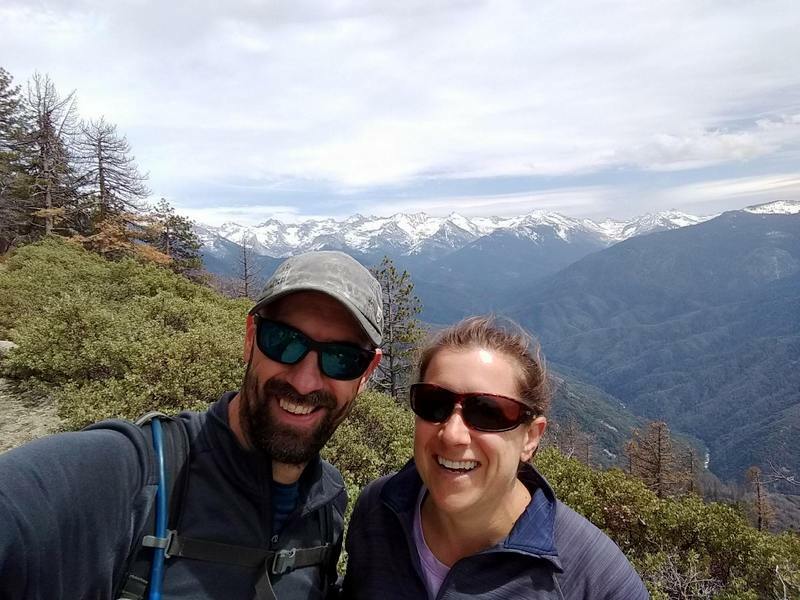 It travels for 13.5 miles before connecting to the High Sierra Trail. Of the dozen or so hikers we encountered, we were some of the few without overnight packs. 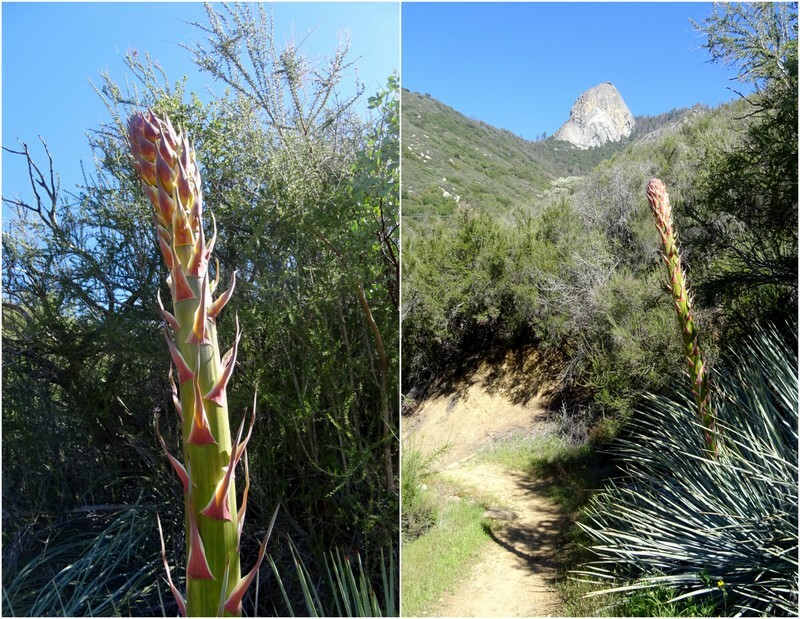 Is it just me, or do these yucca flower stalks look like giant asparagus? There are a couple of river crossings that we thought would make for good turn around points. The first was at the three-mile mark. 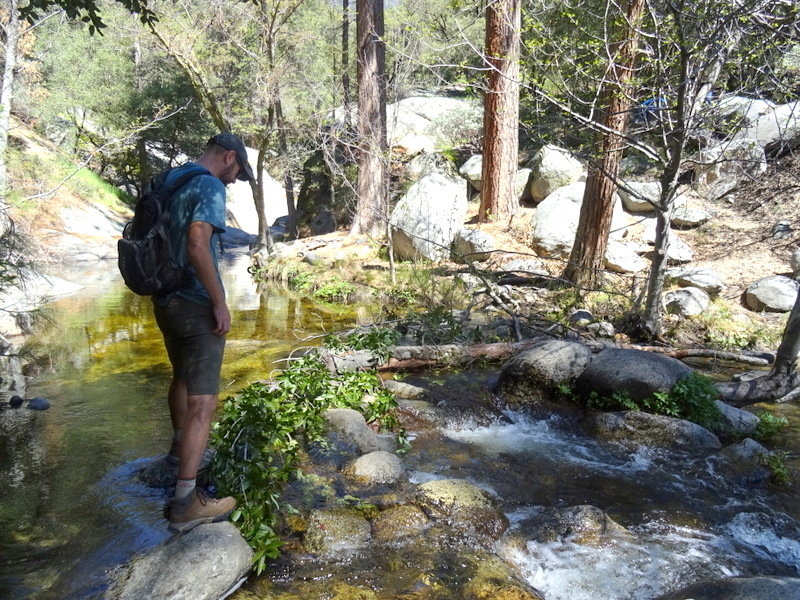 The water was flowing pretty good, but previous hikers had left a “bridge” of branches and we easily made it across. I thought the second crossing was at mile five, so we decided to keep going and make it an even 10-mile round trip. After 5.7 miles we still hadn’t reached the crossing and after resting and snacking decided to turn around. Later we learned that the crossing was actually 5.8 miles from the trailhead which means we were very, very close. Outside of the park, we did a little exploring around the tiny mountain town of Three Rivers. Of course, we had to visit the brewery where we sat outside and tried all three beers on tap. They were delicious. 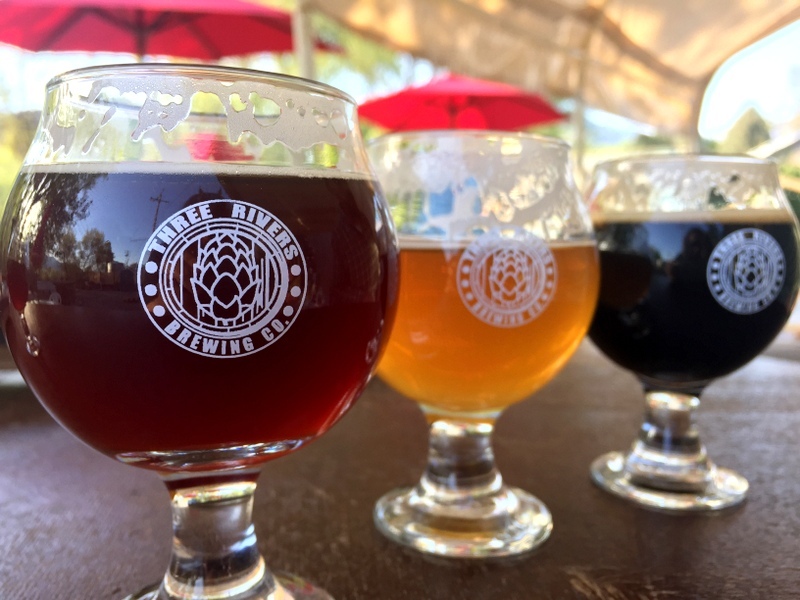 Two thumbs up for Three Rivers Brewing! No food at the brewery so we walked over to the Buckaroo Diner and shared a grilled cheese and the most amazing fried chicken sandwich. Buckaroo was so good that we went back later in the week for a second visit. It’s pretty rare that we eat out more than once per week, and even rarer that we return to the same restaurant twice, so you know it was good! One afternoon we set out on a hike high in the hills above town. 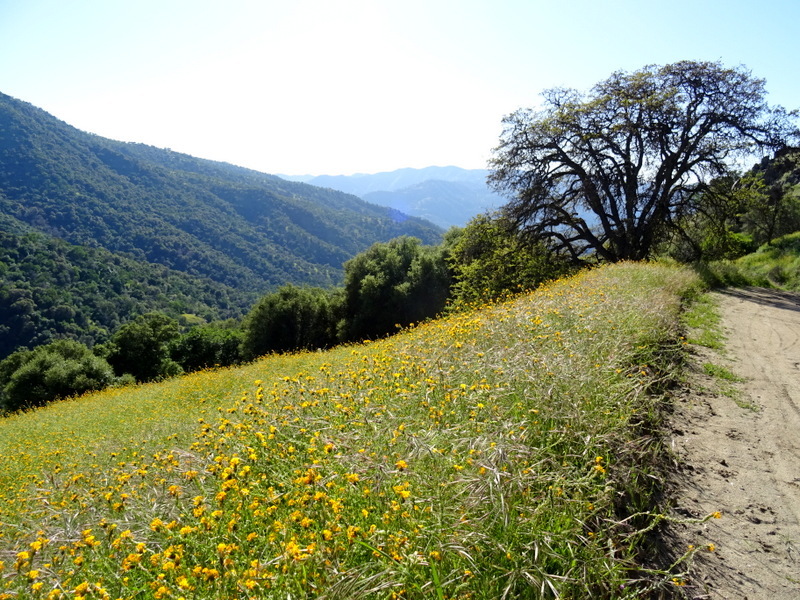 The Skyline Trail is a 6.5-mile loop that travels up a winding dirt track past waterfalls and wildflowers. On the way down we hiked through what looked like an old fruit tree grove and along the river. 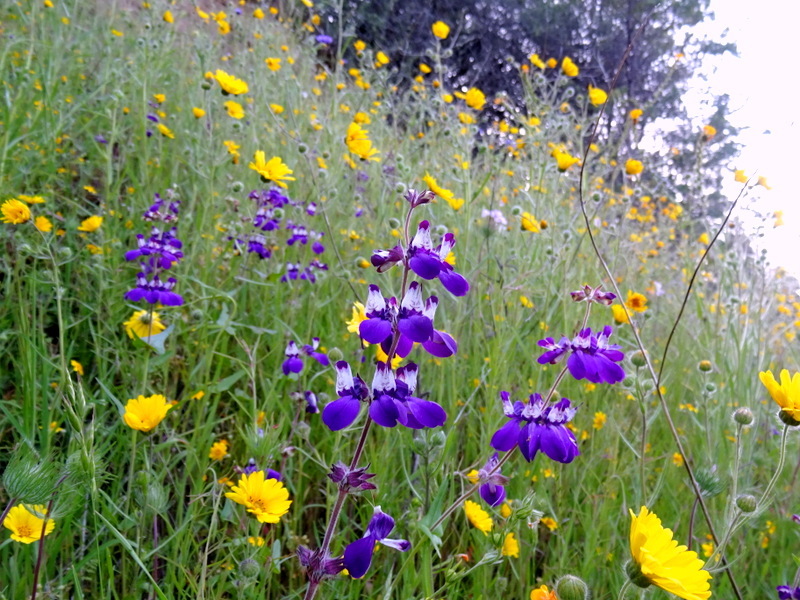 I loved everything about this hike, but the wildflower display took the prize. We departed on Sunday with lots left to explore in the area. 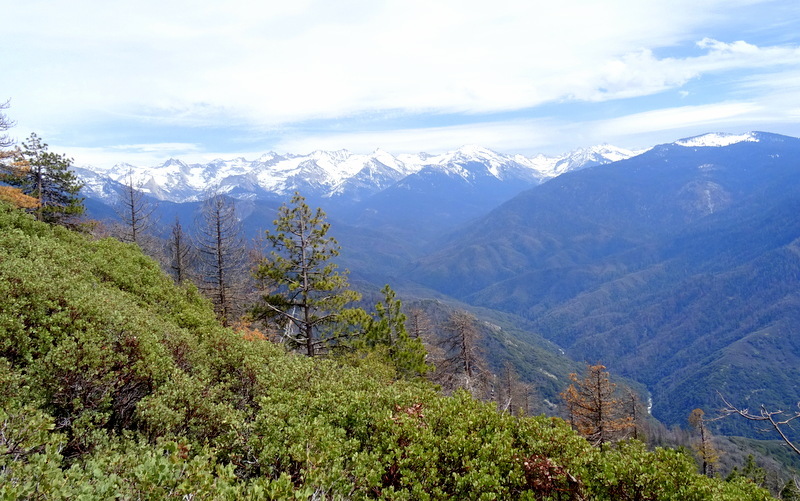 We’re treating this trip up the western side of the Sierras as an overview visit. Tim has some stuff going on at work right now that prevents him from being away from an internet connection for an extended time. That means my dreams of overnight backpacking or any weekend off-grid trips are on hold for now. But we’re getting lots of ideas for future visits and making an effort to enjoy the time that we do have. Next, we move north to see more big trees and a giant canyon! Thanks for sharing! 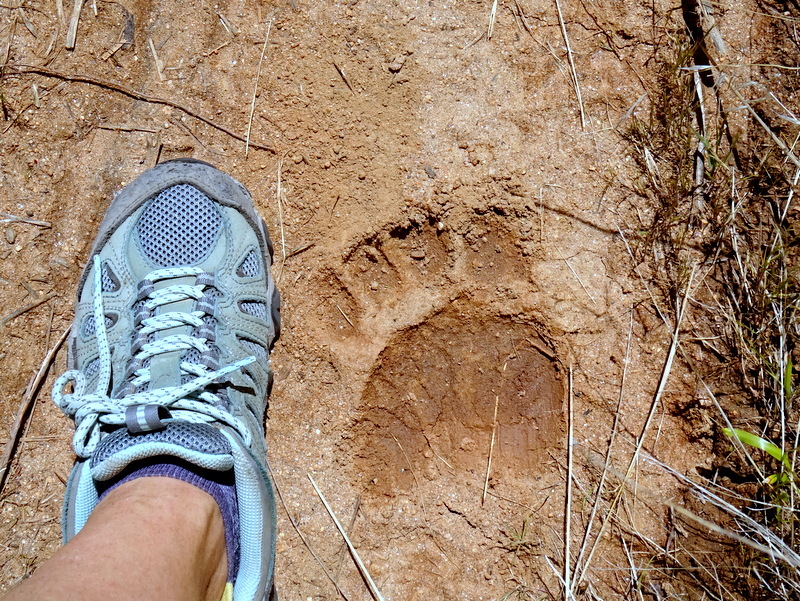 We also had an encounter with a bear and cubs while hiking in Kings Canyon. Fortunately, they scampered off as soon as they saw us! 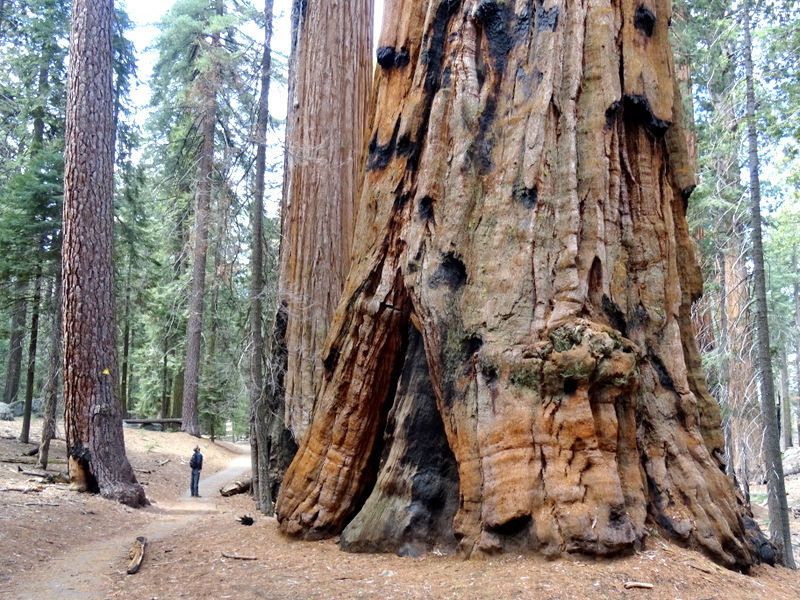 We plan to visit Big Trees SP this weekend! That is such a gorgeous area! 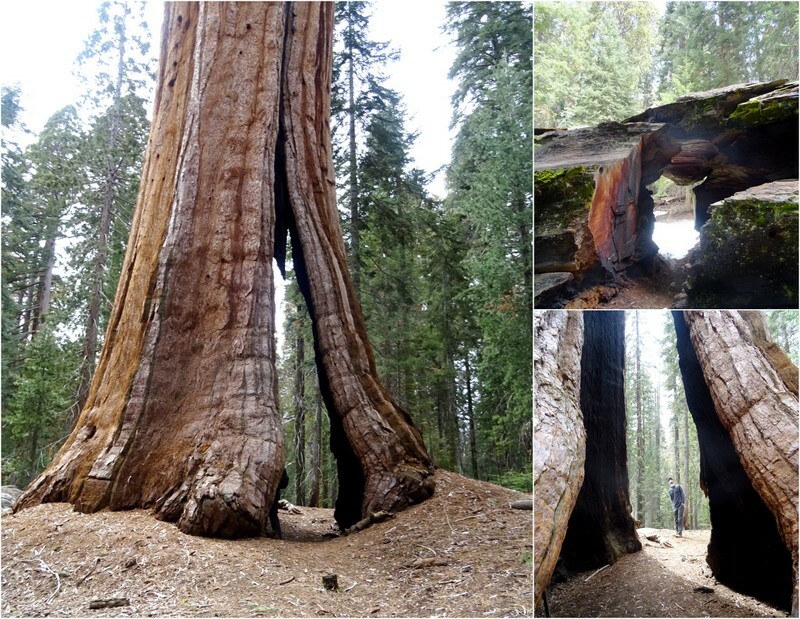 I have not visited Sequoia for at least 20 years…looks like we need to put it on the list! 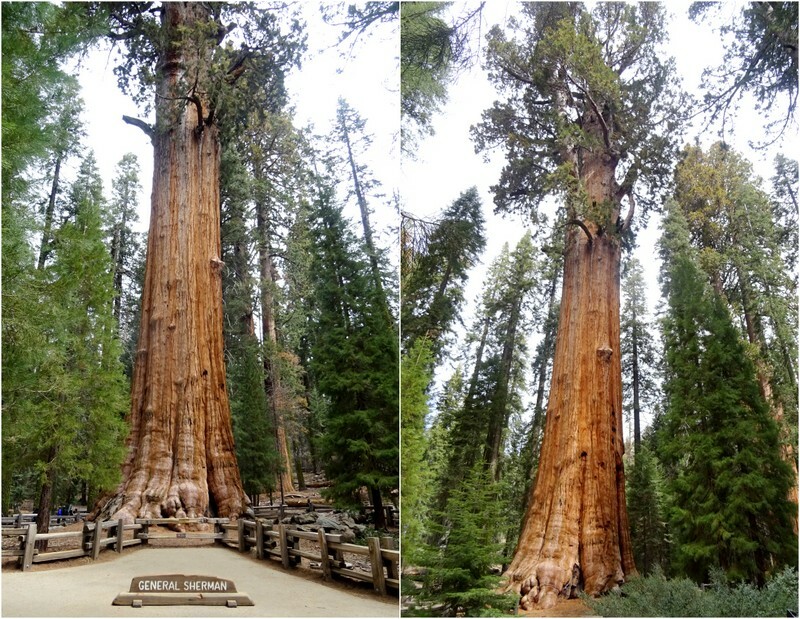 Big trees are awesome! Absolutely put it on the list! We were blown away by the beautiful forests and stunning views all over the park. 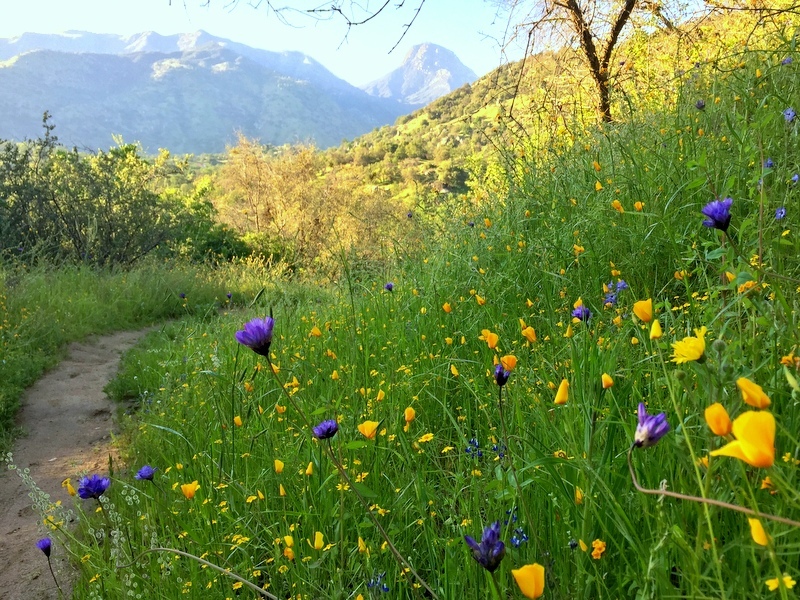 OMG those wildflower pics are wonderful Amanda!! This is another place this native Californian hasn’t visited yet. We hope to remedy that next spring. Will definitely keep an eye on the water levels! Can you tell I was excited to see all those flowers? I didn’t mention it in the post, but the Sequoia Campground where we spent a few days had a row of really nice sites right on the river. They were designed for motorhomes to pull-in and enjoy a view out the front window (with hook-ups on the side that allows this orientation). Great sites if you have the right rig! 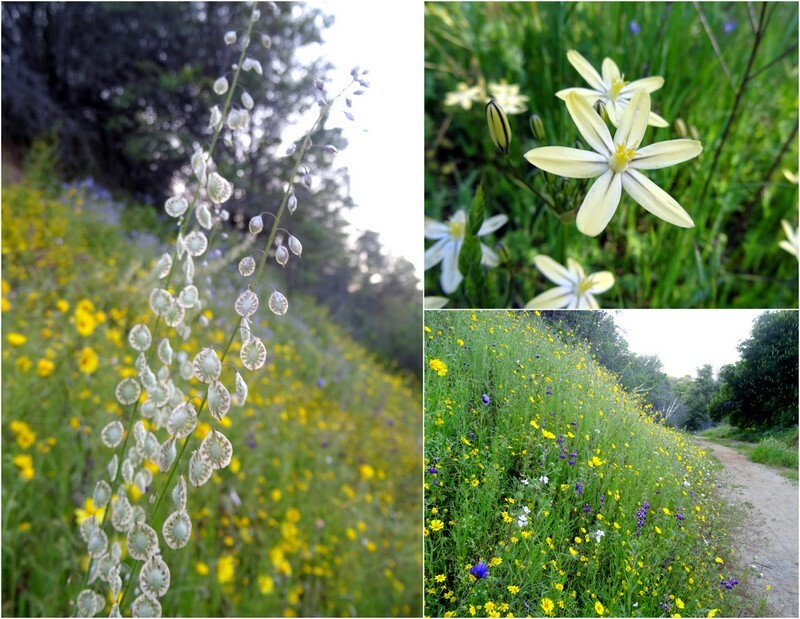 Such beautiful photos! Thank you. 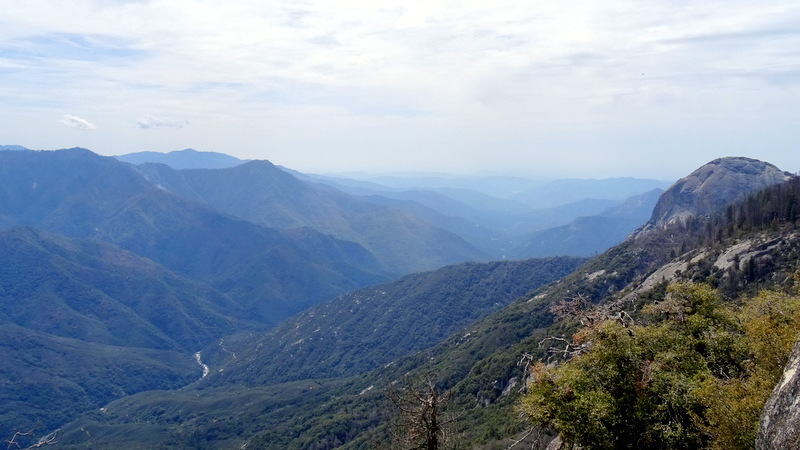 I really enjoyed being in Sequoia National Park, even though the hairpin turns were a real challenge. So wonderful just to stand among the giant trees and realize where I was.